Pearl Harbor and the Beaches of Normandy. or to order a copy. 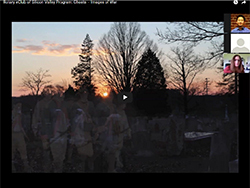 Want to be among the first to get updates on the Ghosts project? Sign up for our email list or friend us on our Facebook fan page and we'll send you a notice whenever something happens. We will also notifiy you about upcoming shows, write-ups in the media, or exciting new pieces. The email goes out a few times a year, and we promise to respect your privacy. We will not to give or sell your email address to anyone else. A special THANK YOU to all my backers on the project! The book is printed and turned out even more beautiful than I expected. I hope you all are pleased with it as well. You can buy it on the Swiss Creek Publications site. Thank you all for going on this journey with me. I'll be doing a follow-up appearance on the Darlene Carmen show in February to talk about the process and how the project progressed since the last appearance in July of 2013. I'll post the video when I have it. If any of you are interested in having a book signing, please let me know. Thank you!!! The book is done!!! The final book is 72 pages of Ghosts images, info about the wars and the sites I visited, anecdotes about my visits to the sites, and stories about members of my family that were there during the Revolutionary War, the Civil War, WWI, and WWII. The book is going to press this week. I'll keep you updated on when and where it will be available. I'll also let you know about any book signing events I'll be at. Thank you to everyone that helped make this book a reality. It's been a gift for me to create it. Thank you!!! We're down to the final stretch for the Ghosts book. I've hired the PR firm Three Girls Media and they have been hard at work getting ready to roll out a media campaign for Ghosts. 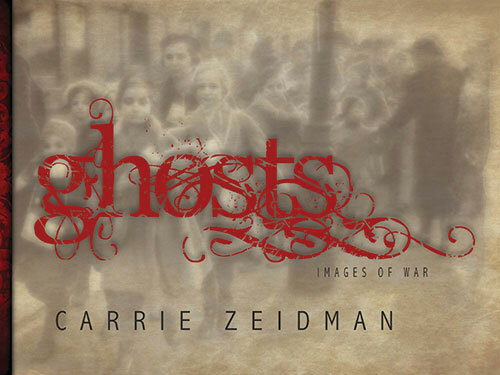 The final title is "Ghosts - Images of War" and the cover art and images are all finished. I'm still finishing up the text that goes along with the images. I can't wait for you all to see it! Thank you again for your patience during the delays in completing the project. More soon! Check out the final book cover art above! I'm back from two weeks in Europe shooting WW1 and WW2 battlesites. It was an amazing trip and I can't wait for you all to see the images I came back with. I have approximately 3500 images to sort through and work with! The first week we were traveling with a National Geographic tour and had access to some wonderful guides and historians that took us to some very interesting sites. That part of the trip we covered London, Portsmouth (where the D-Day Invasion was launched), the beaches of Normandy (Utah, Omaha, Gold, and Pt. DuHoc), and Paris. When I walked on the beaches at Normandy I could almost see the boys running up from the water line under fire from German guns. It was rainy and cold the whole time we were there, giving the atmosphere a fitting solemn appearance. The second week, Bob and I drove ourselves around France and Belgium. We covered Ypres, Dunkirk, Verdun, and Meaux before heading back to Paris. There is still so much history to see at these sites. We walked through grass covered trenches and concrete bunkers that are still there 100 years after WW1. The museums give you the background, but to stand on the ground where the great battles took place is an emotional experience like none other. I hope to capture that experience in my next series so I can share it with all of you. Thank you all again for making this project possible. I hope to do you all proud. I've been going through lots and lots of old photographs from both WWI and WWII in preparation for our trip in May. We'll be going with National Geographic to cover London, Normandy, Paris, and several little villages along the way. After Paris, I'll be renting a car and driving to the French/Belgium border to cover several sites that saw action in WWI. On the list are Ypres, Flanders Field, Poperinge, Mons, Somme, Compeigne, Meaux, Chateau Thierry, Belleau Wood and Verdun. Also, some of the first images from the Pearl Harbor series should be finished soon. I'll post them when they're ready, and let you know when they're uploaded! We just finished making our plans for the last trip in the project. We'll be going on a National Geographic Expedition in May of 2014 to cover London and France, including Normandy and several little villages along the way. It's a great opportunity to work alongside experts in history and photography from National Geographic and I'm looking forward to learning from them as we go through the historic sites. It's also the anniversary of D-Day next year, so that makes it even more special. We'll be adding our own side trip to the adventure and heading up to the French - Belgium border to cover sites from WW1. It's also the 100th anniversary of the start of WW1. 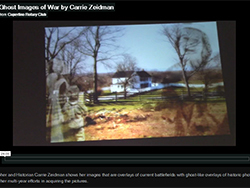 The Civil War images are finished and uploaded! 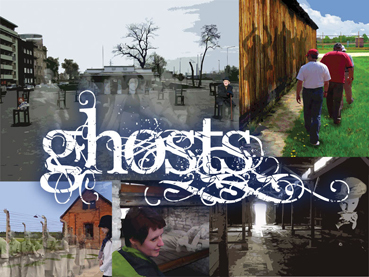 Check out the Ghosts gallery to see them all. I love the way they turned out and can't wait to hear your feedback on them. I'm now moving forward a few decades and starting the Pearl Harbor series. I just got back from Hawaii a couple of weeks ago and I have some wonderful photos to work with. I even climbed up Diamond Head to get some great aerial shots! I'm also in the process of planning the trip to France for the Normandy and World War One series. I'll be covering the beaches of Normandy, and maybe even some of the bombing of London. Then we'll move on to the French/Belgium border to cover sites such as Flander's Field, Somme, and other important sites from WWI. 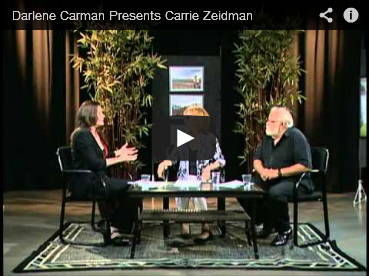 I was interviewed on the "Darlene Carman Presents" show a few weeks ago. Click Here to see the interview. Getting ready to head out to Hawaii to photograph Pearl Harbor and start on the new series when I return. The Civil War series is mostly done. There are 5 finished pieces with 3-4 more almost finished. 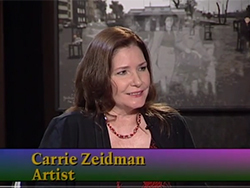 I was interviewed on "Darlene Carman Presents" about the series. I'll post a link to the interview when it's online. I've added a series to the project. I'll be photographing sites from WWI while I'm in France for the Normandy leg of the project. I'll be going up to the France/Belgium border to cover several battle sites. I spent Memorial Day weekend up at Roaring Camp in Felton, CA photographing the Civil War reenactments going on all weekend. I got some great shots of soldier to use as the "ghosts" in the Civil War paintings. I got some fabulous shots and I can't wait to use them in creating this section of the project! Watch for a sneak peek at the new paintings coming soon! In July I'll be starting on the next leg of the project, Pearl Harbor. I'll be going to Hawaii at the end of July to gather the shots for this next exciting section. In November we went on the first photo gathering trip and came back with over 1600 amazing photos from several sites on the east coast. We put over 1100 miles on the rental car covering battle sites from New Jersey to Virginia. We covered The Old Tennent Church in Manalapan, NJ, Valley Forge, Gettysburg, Antietam, Washington D.C., Richmond, VA, and Appomattox Court House. I'm working on several paintings based on the photos from the battle sites. I'll be shooting photos at the Civil War reenactment at Roaring Camp this spring to get some period photos of the soldiers to use in the final images. We topped the trip off by watching the movie Lincoln in Lynchburg, VA the same day we visited Appomattox Court House. It was a great movie, but was greatly enhanced by the setting. We'll be traveling to Hawaii to cover Pearl Harbor later this year, and will be scheduling our trip to France to cover the beaches of Normandy soon. I've been busily gathering information on Revolutionary War and Civil War battle sites, and my first photo gathering trip is scheduled for November 23-30. It will be a one week road trip starting in Philadelphia, PA and ending in Lynchburg, VA. In between I'll be photographing Valley Forge and Gettysburg in PA; Old Tennent Church and Rose Hill Cemetery (a Revolutionary War period cemetery) in NJ; Antietam in Maryland; Seward House, Lafayette Square, Ford Theater, and the Fort Delaware Prison in D.C. In Virginia I'll be visiting about a dozen places including Appomattox, Lexington, and Harper's Ferry. I'll be starting the first paintings as soon as I get back to the studio. As for the future, the Pearl Harbor trip is scheduled for early August, and I will be scheduling the trip to Normandy shortly. Thanks to one of my Linked-In history buddies, I have a wonderful itinerary for touring the beaches of Normandy that I'm sure will prove to be very helpful in covering a lot of the area and getting some wonderful images. I'll keep you all updated and post photos when I return from the trip. Thank you all for making this project a reality. I will try my best to create paintings you can all be proud of and that do honor to the conflicts and times they will represent.